Get total peace of mind with comprehensive jewelry insurance. Okay, we can all agree that jewelry insurance is not the most romantic thing to talk about, especially when you’re still glowing from the wonderful high of being newly-engaged. But, as with most significant things associated with adulting – like planning a wedding or securing your first mortgage — it’s something that requires careful consideration. That said, insuring your engagement ring isn’t as difficult a process as it sounds, and the result — peace of mind above all else — is totally worth it. You’ll want to hold on to that precious ring forever! Insure it for all its worth. Insuring My Engagement Ring. Where do I begin? A bit of research is always a good way to start before committing to any insurance policy. If you’ve been googling for a dedicated jewelry insurance, Jewelers Mutual Insurance Company is probably one of the names that keeps popping up. And for good reason. Jewelers Mutual® is an insurance company that exclusively insure jewelry. The company was started by jewelers for jewelers over 100 years ago, in other words: they really know their stuff. Jewelers Mutual policies are built around the way you live your life, so whether you travel a lot or love adventures in the great outdoors (or the kitchen! ), you can wear your ring, worry free. Ring insurance can be purchased through a “jewelry rider” or policy extension attached your homeowners or renters policy. Note that riders may only cover up to a certain dollar value so it’s always good to ask questions. If you plan to get your ring covered this way, some questions to ask: what’s the limit to the coverage? How do I increase my coverage? Does the policy cover accidental loss, damage, mysterious disappearance or theft? While homeowner’s riders may cover loss due to theft (up to a certain value), to get coverage that extends to accidental loss, damage and mysterious disappearances, you’re better off with a comprehensive jewelry insurance like the one provided by Jewelers Mutual. Other advantages of a specialized ring insurance include coverage wherever you go – even on your travels worldwide, replacement of ring of the same kind and quality (good news if you have name-brand jewelry), and the availability to work with your preferred jeweler. Jeweler Mutual’s customers also have access to a simple personal online account management service at any time. He proposed with your dream engagement ring. Always keep it safe! 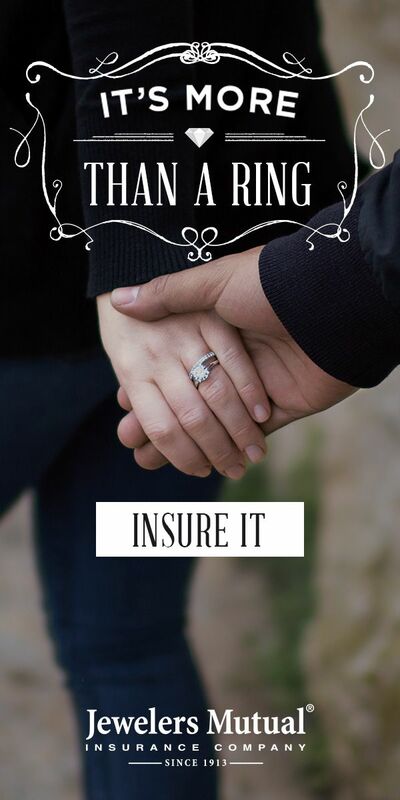 Ready to get your engagement ring insured? Get a free quote here – it literally takes just a few seconds and no contact info is required!